Real Estate & Relocation ^ Colorado - Liftoff! 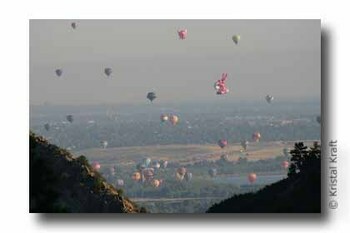 Early this morning the balloons lifted off in the Rocky Mountain Balloon Festival. I was shooting pictures up at Roxborough Park above the balloon site. It was so windy where I was, I didn't think the balloons would fly. As I descended Long's Lookout I looked to the north and what a lovely site it was! At least 50 balloons airborne against the horizon. The Festival continues through Sunday. Oh yes, there's a Balloon Glow this evening, if I can stay awake that long, I'll be there! BTW photo was shot with a 400mm lens, f10 @ 1/500 sec. As I said I was a few miles away as the crow flies. Great shot, what a cool thing to see. LAR ~ I hope the chill was a good thing! Ines ~ It was a pleasant surprise. You know I love your shots Kristal - that must have been a site!